It’s Houston. It’s August. That’s all you need to know to expect long days of intense sun and scorching temperatures. With daily forecasts in the triple digits and no break in sight, chances are that you have been struggling to keep your pool clean and well maintained. The same weather that drives Houstonians inside to the A/C also creates perfect conditions for algae to grow and flourish. Take heart, there is no need to question everything you know about pool maintenance. By following these few tips, you can win the summer battle against algae and keep your pool the clean and beautiful place where everyone loves to cool off. When the thermometer runs out of lines and there’s not a cloud in the sky, trees and plants really feel the heat. It is normal for dry flowers, leaves, seed pods and bark to shrivel up and fall off, accumulating in your pool even more than usual. As organic matter decays, it releases nitrogen which algae needs to grow and thrive, thus the more plant debris in your pool, the faster algae can develop. Don’t feed algae! Skim plant debris at least once a day, and be sure to empty the pool’s skimmer baskets daily as well. Heavy debris causes baskets to fill up faster and can impede the effectiveness of your filter. We usually recommend brushing you pool’s walls, floor, steps and benches at least once a week as part of your regular pool maintenance routine. But when fighting a war with algae, upping to two brushings per week is a good idea to discourage build up. Many pool owners don’t realize that the UV rays of the sun can actually break down the free chlorine in pool water. This time of the year when daylight hours are longest and the sun is at its most intense, a perfect amount of chlorine in pool water can be degraded in as little as two hours! That is why it is so important to increase the frequency of your chlorine testing. 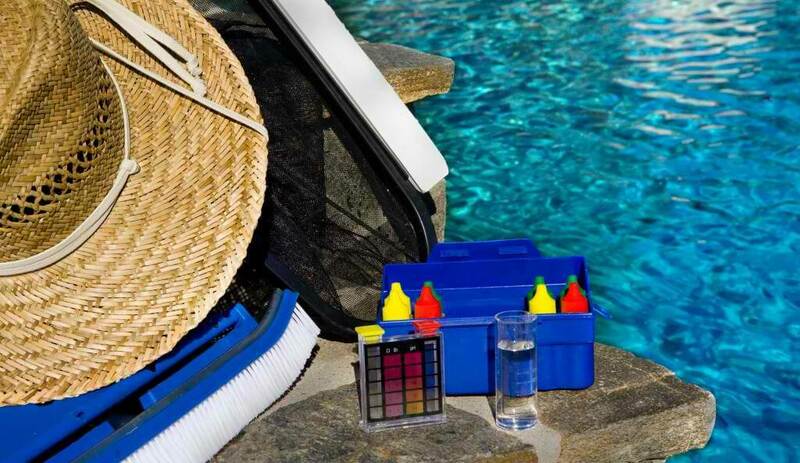 We recommend testing daily until you get a feel for how UV rays are affecting your particular pool and how often you need to be adding chlorine during this crazy hot season. Knowledge is power, and testing arms you with the knowledge needed to be proactive with chlorine rather than struggling to get rid of algae after chlorine levels have dipped too low. Well, not really desperate measures, just a couple of steps that are not a part of a normal pool maintenance routine! If you are reading this blog too late to prevent algae from becoming a problem in your pool and spa, don’t lose heart. Follow the above steps and ask your local pool water chemical specialist for their recommendation of an algaecide product that produces best results for your area. Use as directed and be sure to brush the pool well after the appropriate interval. Finally, remember that once you do succeed in killing algae and dislodging it from your pool’s interior surface, it is removed from pool water by your filter. Unfortunately, algae can quickly clog up your filter, making it necessary to perform a good filter cleaning according to the manufacturer’s instructions for your particular model. If you feel that this is beyond your comfort zone or ability, contact Elite Pools and Spas to request a one-time filter cleaning. Of course, you may decide that you have better things to do than clean your pool- like swimming in it! So for all of your pool maintenance and service needs, call Elite Pools and Spas. Our highly-trained and professional staff are uniquely acquainted with the challenges of caring for Houston-area pools, and can keep yours in tip-top shape and ready to be enjoyed.